(a) Start the engine, and shift the transfer shift lever to the "H" position. (b) Check that the center diff. indicator light comes on when the the switch is in "ON" position. Check that the light goes off when the switch is in "OFF" position. (a) Start the engine, and turn the center diff. lock switch to OFF. (b) Check that the center diff. indicator light comes on when the transfer shift lever is shifted to the "L" position. Check that the light goes off when the lever is shifted to the "N" or "H" position. (a) Check that continuity exists between each terminal, as shown in the chart. *: There is a diode between the terminals 6 and 7. If no continuity exists, check that continuity exists when changing the position of probe for the position of negative probe of tester. (b) Apply battery positive voltage between each terminal and check that continuity exists between each terminal, as shown in the chart. 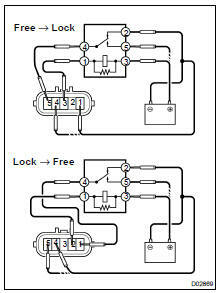 If continuity is not as specified, replace the relay. (a) Raise up the front wheels, place the stopper under the rear wheels to block them, and pull up the parking brake. (b) Disconnect the connector of the actuator and connect it to the relay using wire. (c) Check that the front propeller shaft can be rotated by hand. HINT: When inspecting the operation described above, use a heater main relay. 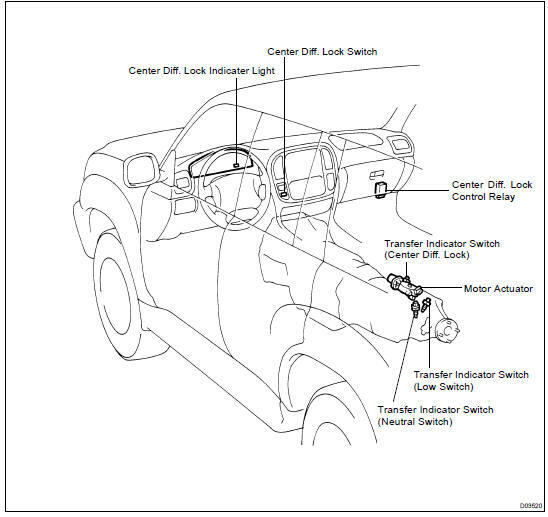 NOTICE: Connect the terminals being careful not to touch the neighboring terminals or metallic parts of relay housing. (a) Remove the motor actuator ( TR-8 ). (b) Measure the resistance between the terminals 1 and 5. (c) Measure the resistance between the terminals 1 or 5 and body ground. If the resistance value is not as specified, replace the motor actuator. (a) Remove the center diff. lock switch ( AC-102 ). (b) Inspect the continuity between each terminal. (a) Remove the 3 transfer indicator switches ( TR-8 ). (b) Check that continuity exists between terminals 1 and 2 when pushing the ball at the tip of the switch.